Monks leave the meditation hall at Wat Phra Dhammaya at the start of their 450 kilometer pilgrimage through central Thailand. 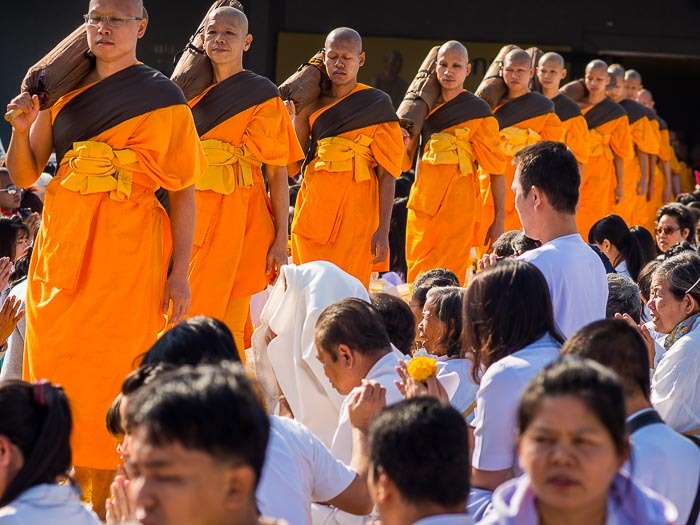 More than 1,100 monks from Wat Phra Dhammakaya, a huge temple and meditation center north of Bangkok, set out on a 450 kilometer walk this morning. The monks are passing through six provinces in central Thailand. 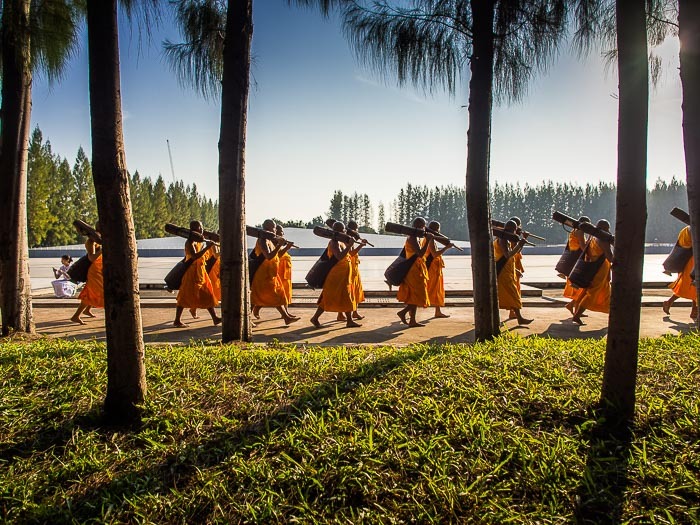 Monks walk into the grounds of Wat Phra Dhammakaya to start their long pilgrimage. They will be on the road until January 28, when they return to Wat Phra Dhammakaya. During the trip they will sleep at schools and temples and eat food prepared for them by Buddhist lay people along the route. 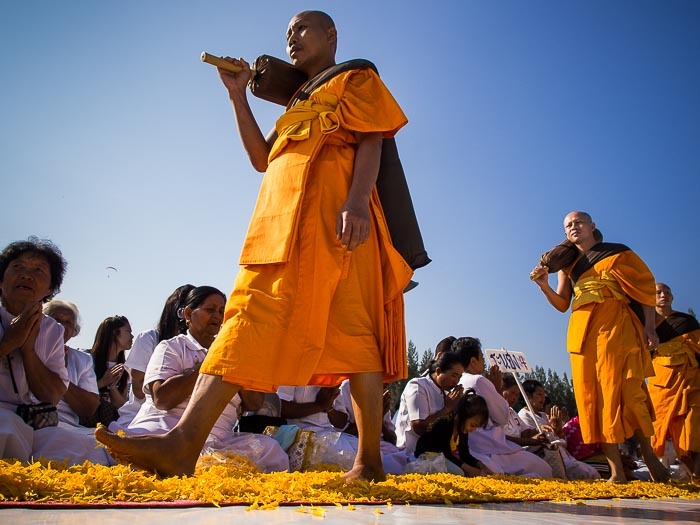 This is the 4th year of the pilgrimage, it's become a New Year's tradition for people from the Dhammakaya movement. The purpose of the pilgrimage is to pay homage to the Buddha, preserve Buddhist culture, welcome the New Year, and "develop virtuous Buddhist youth leaders." I will only be able to photograph the first day of the pilgrimage this year. I have a busy January coming up and, while I might have some free days this week, I know I'll be fully booked late in the month, when the pilgrimage ends. 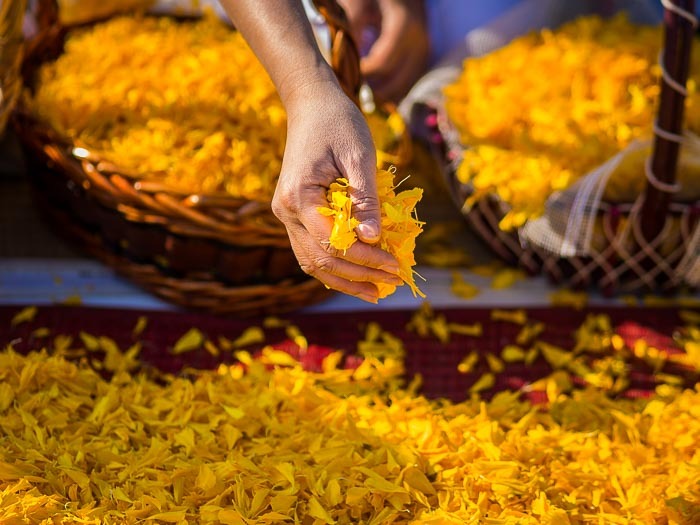 A person places marigold petals on the monk's footpath. Laying marigolds on the monks' path is a form of making merit. There are more photos from the first day of the pilgrimage in my archive or available from ZUMA Press.